Nigerian R&B duo singers P-square (Peter & Paul Okoye) have debunk rumors of sacrificing their mother 'Mrs Josephine Okoye' for illuminati money and fame; Nigeria Music Network is reporting. Do you know how to do JJC's African Skank dance? If not, why not learn how to do the African Skank by watching the dance videos featured on Nigeria's music network? Ever wanted to know how to do the JJC's African Skank dance? In the following dance video, Sani DanceMachine Dance Group from Ahah, Lagos, do the African dance from Nigeria, to Ghana, Kenya, and South Africa. Can you beat it? Check out the dance moves in the video below and get practical at home. If you know how to do the African Skank dance, don't hesitate to make a short YouTube video of yourself doing the African Skank dance and send to us via email: video[at]nigeriamusicnetwork.com and also send to JJC via his channel at Youtube/JJCOfficial. Let us know what you think of the African Skank dance moves in the comment box below. Dapo Daniel Oyebanjo popularly known as D'banj as his stage name, was recently spotted at the 2012 7th Annual LudaDay Weekend in Atlanta, Georgia with the DTP boss himself, Ludacris. Photos of D'banj with Ludacris were taken at the LudaDay Weekend event. Ever since news broke about D'banj signing a record deal with Kanye West's GOOD Music, the former Mo Hits record boss has been gaining lots of international recognition, especially in the UK, and US. The photo below shows D'banj hanging out with Ludacris at the LudaDay Weekend. D'banj and Ludacris photo, during the LudaDay Weekend in ATL. The 7th Annual LudaDay Weekend was made possible by The Ludacris Foundation, Disturbing Tha Peace Records, and Ebony Son Management; in partnership with Soul by Ludacris Headphones. The importance of giving back to the community was the primary focus of the LudaDay Weekend 2012. Below is another photo of D'banj and Akon at the LudaDay Weekend in ATL. More photos of Dbanj in ATL below, this also happen to be a Labor Day weekend in the United States. D'banj with Cydel Young, better known as CyHi Da Prynce. We hope D'banj will tap into some of the entrepreneurial skills of the ATL-based lyrical rapper, Ludacris, who has remained relevant both in the rap scene and music industry consistently for a long time. Besides Ludacris, the LudaDay Weekend was graced by many big names in the music industry and entrepreneurs alike. Is Peter Okoye of P-Square and Lola Omotayo expecting a second child? Is Peter Okoye of P-Square expecting a second child? 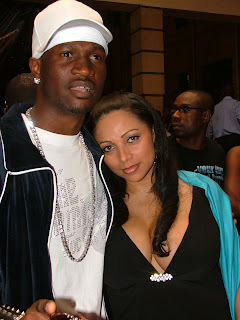 Nigeria Music Network gathered that Peter Okoye and Lola Omotayo are indeed expecting a second child. This great news came just few days after the Okoye family buried their late mother, Josephine Okoye. Peter Okoye, the twin brother to Paul Okoye of P-Square is expecting his second child. Today, 10th of August, Peter Okoye announced the good news via his Twitter page "@PeterPsquare: So Happy!!! We are expecting another child!. Thank God for the gift of life". Many of his fans on Twitter are deeply excited for Peter Okoye, and did not hesitate retweeting after him immediately after the announcement. Lola Omotoya, a business development director for a Lagos-based Marketing firm, is the long-time girlfriend of Peter Okoye and the mother to Cameron, Peter Okoye's first son. The first child of Peter Okoye was born 23rd of September 2009, that means Cameron's birthday is coming up next month. Nigeria Music Network will attempt to reach out to Peter Okoye's management to confirm the expected arrival of his baby, but our guess is sometime next year, 2013. Peter and Paul Okoye, popularly known as P-Square, are top selling Nigerian R&B duo singers whom are also identical twin brothers. The duo produce and release their albums through Square Records. However, in December last year, P-Square were signed to Akon's Konvict Muzik label along with WizKid and Tuface Idibia. In May of 2012, they landed a record distribution deal with Universal Music South Africa. Nigeria Music Network and staff congratulates Peter Okoye - as he adds a second child to the family. Big Congrats! Nigeria Music Network is the #1 music video sharing site for Nigerian Hip-Hop, Nigerian Gospel, R&B, AfroBeat, Highlife, Reggae, and much more. Also featuring Nigerian artists biography, Naija music industry gist and gossip, and promotional articles written by our editors. Nigeria Music Network also provides PR services, music and artist publicist for hire, assisting Nigerian musicians and bands create awareness for their shows, project, public relation campaigns, album releases, etc., for both independent artists and record labels. Contact us to discuss the publicity that's right for you or your artiste. WizKid's Baddest Boy Featuring Skales Leaked! Wizkid’s new single “Baddest Boy” featuring Skales has once again been leaked online without the approval of Empire Mates Entertainment. WizKid has been trending the internet a lot this days as many are highly anticipated about his upcoming album. Just few days ago, WizKid's Sisi Nene was also leaked and many people are loving the track so far. However, WizKid in a recent tweet says he doesn't like the song and it didn't make his new album. The song has got the terrific beat and sound that we have come to expect from the young artiste. Sisi Nene was produced by Jay Sleek, which is something to wet your appetite as we wait for the official single and music video of “Baddest Boy” set to be released soon.